12 Little Books my Grandchildren Reach for Over and Over and Why You Should Get Them! Are there certain books that your children or grandchildren want you to read to them over and over? There is a set of books at Grandpa and I’s house that are just that! They are nursery rhymes. 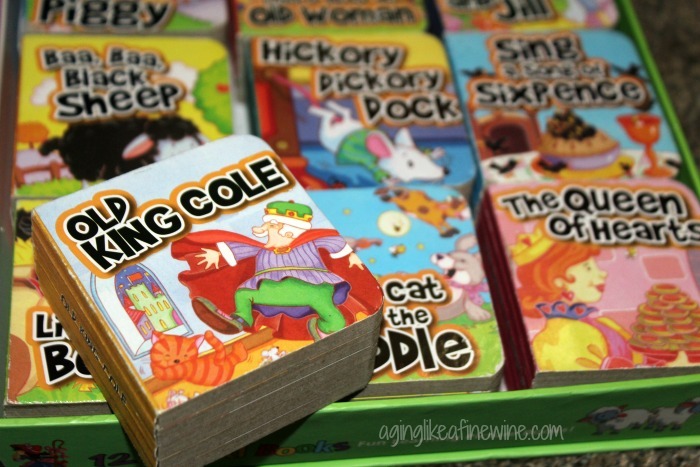 12 little board books that come in a box that looks somewhat like a book itself. There is something about these small books that toddlers just love. I purchased our set of books when our 7 year old granddaughter was 2 years old. She loved them, then the next one loved them, and the next one loved them and the next one! 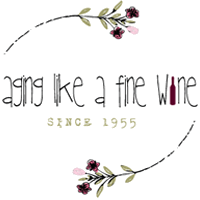 There are affiliate links within this post. However, all opinions and thoughts are my own. Clicking on and using the links to purchase products does not increase your cost at all and it is greatly appreciated! Thank you! Yes, this book set is on it’s 4th child and 1 year old Gideon now loves them. Every time he comes over he carries the big book that holds all the smaller ones out of the bedroom and hands them to us book by book to read to him. 3 year old Zellene still loves them as well. They show their wear by the bindings that are duck taped! I don’t think they are actually making this set any longer, but you can still find it on Amazon right here. If you have a baby in your future whether as parent or grandparent, I don’t think you will ever regret buying these books! 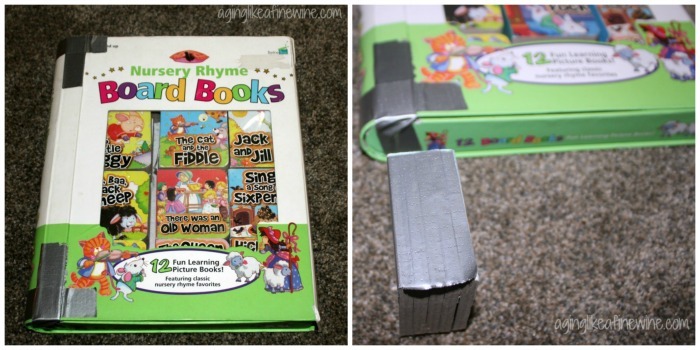 Nursery rhyme books come in all kinds of sizes and combinations and regardless of the style, they are beneficial to our children. In a study done by the Center for Early Literacy Learning, results showed that reading nursery rhymes to children between the ages of 3 and 6 increases their literacy abilities in the three years that follow. Mem Fox in her book “Reading Magic” states it another way, “experts in literacy and child development have discovered that if children know eight nursery rhymes by heart by the time they’re four years old they’re usually among the best readers by the time they’re eight”. Research on the human brain has shown that we remember in patterns. Reading books that rhyme to our little ones significantly increases the number of words they can easily read as a beginning reader. Nursery rhymes are good for the brain, they expand our children’s imagination, improve their vocabulary and they are just plain fun. If you haven’t been reading these adorable little rhymes to your grandchildren it’s never to late to start! What nursery rhymes do you remember the most? Do you read, or sing them to your children or grandchildren? This post will be shared on the wonderful link parties found on my “Where I Party” page! We always read to our children and grandchildren when they were little. It makes a huge difference when they get to kindergarten. Most of them are still avid readers. I was just saying last night that is it summer and we have not been doing our “homework” with the 2 yard. During the school year when the older kids are do homework we tell the 2 year old he has to do homework too. Reading to the 2 year old now will help to create a love of reading that will last a lifetime. So I agree, that “homework” is so important! This looks like so much fun! My kids would love to read these great books with me! They are cute little books and I think it is the size that fascinates little ones! That is probably one of the best known ones because of the cute little actions you do with it. We love nursery rhymes. There are so many that you really do forget about. Great collection! I agree, when we haven’t had little ones around for many years we do tend to forget. It’s fun to become familiar with them again! What a cute set of books, perfect for this Grandma’s house too! I remember hey diddle diddle the cat and the fiddle the most! I agree that we need to pick this tradition back up. We read to our two children twice a day and encourage it through play! I remember Jack and Jill and Humpty Dumpty, the most 🙂 I’m hoping my kids appreciate them as much as I did! As a child growing up we had a big book of Mother Goose nursery rhymes and I remember reading it over and over again! It had all the classics, Old Mother Hubbard, The Cow that jumped over the Moon, Humpty Dumpty, Hickory Dickery Dock, ect…. Would love to have some of these for my girls as well! I commented on the giveaway post. My little girl loves these. They’re her absolute favorite. It would be awesome to win these for her. Thanks again. 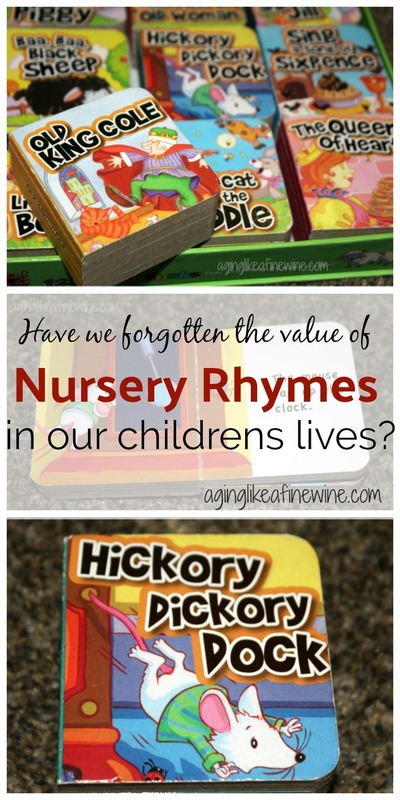 The nursery rhymes I remember the most are Baa Baa Black Sheep and Hickory Dickory Dock. I sing the nursery rhymes to my children. These are adorable and obviously made to last. I believe children retain what they say as rhymes or songs easier than just reading the books. When my granddaughter forgets an alphabet letter, she immediately sings the alphabet song and then remembers the letter. It’s quite cute! I agree Nursery Rhymes are so vital to the early stages of reading. You gave your granddaughter such a wonderful foundation with these books. I would love to win for my two boys ages 3&4. I want to give them to my parents for their house. They take them every Saturday to the library for story time. Nursery rhymes are so important for early reading development. I totally agree with that. You change your granddaughter such a service reading her these books at an early age. I would love to win them to give to my parents. My boys are ages three and four. They take them to the library every Saturday for story time. 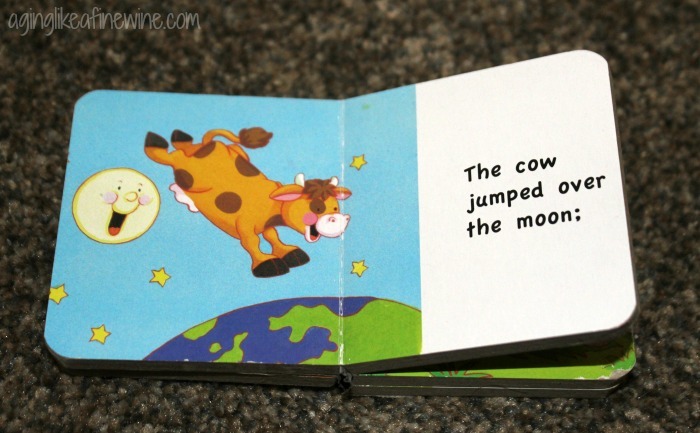 My mom does not have any nursery rhyme books at her house thank you for the opportunity. I have been looking for something like this for my 13 month old. She absolutely loves turning the pages when we read together. I have some apps that sing on my iPad but it’s not the same as opening up a book together. Yes! We have been looking for books that our son will not destroy by trying to chew on them. It’s so difficult for us to have story time with “regular books” as he is always trying to rip out the pages or eat them! My favorite nursery rhyme was “5 little monkeys jumping on the bed” and now my son loves when I sing him that nursery rhyme! Yes! I love nursery rhymes, and we don’t have a book for our grandsons, thought I had one for my son and passed it on to them. I don’t know how much they read it to the boys, so I feel like I must buy one for our house for those times when our grandsons visit. We read a lot of Shel Silverstein and the 5 yo adores his work. Such clever rhymes and so funny and poignant with great illustrations. Thanks for reminding me of nursery rhymes and their importance to children.